In this video diary series, Christian Shostle uses his 3,500 gallon holding pond to show the benefits of using Nualgi. As an expert in aquaculture and an avid user of Nualgi Ponds for almost a year now this will be an ongoing test for at least 8 weeks to help show the biological process of this nanotechnology. It should also help explain the time it takes to purge the holding tank of algae by using Nualgi. Remember, patience is a virtue when balancing your water column. Christian will be sending in videos almost every week so make sure to stay tuned for more updates. 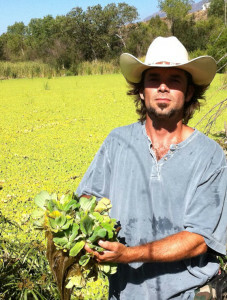 Christian Shostle starts by filling his 3,500 gallon holding pond with spirulina powder and other supplements to make the water turn as green as possible. Why would he do this to his water you ask? The point is to show just how powerful Nualgi is to clean up water and level out water parameters with a natural solution. Christian has a lot of experience and offers many tips for Spring pond opening in another blog post. Christian is the founder of Cali Koi located in North Hollywood California. Christian has been taking care of Koi fish for over 30 years and now specializes in Japanese Nishikigoi. At first Christian was skeptical about using Nualgi in his ponds but in the blog, Christian Shostle Cali Koi Test, you can see how he soon realizes the huge benefits of dosing Nualgi. In an in-depth interview, Christian Shostle talks about water chemisty and aquaculture. Christian traveled through the hills of Japanese Koi farms in the Niigata region and learned the zen teachings not so common in US Koi keepers. During the interview, Christian explained the importance of diatoms in the natural food chain and explained that Nualgi helped the organic compounds by removing the single cell algae that was unbalanced in the pond. Following the Nualgi Ponds Dosing Chart, Christian uses 3.5 mL of Nualgi each week in his 3,500 gallon pond. By the second week he has already started to see a noticeable increase in water clarity. Check back soon to see more updates from his tank. Christian introduces his 3,500 gallon holding pond and discusses his dosing plan. the water is still very green and that there is a distinct green foam accumulating at the top. green foam at the top of his water is a plankton algae die off. Christian also shows us a brown discoloration in the water which is a powerful diatom bloom. All the horrible green tint is completely disappearing! All the fish in the pond are clearly visible and the planktonic algae is gone. Christian discusses that his water is “as good as it gets” and points out that his plant life has exploded since he started dosing Nualgi. Christian’s Lily Pond, has low flow, filled with Plankton and is NEVER clear. After a week and half he could not be happier with the way the water glistens from the sunlight. This is the first time it has been clear in 10 years! Everything is doing really, really quite well in here. Have you had a good experience with Nualgi Ponds? People across the world are using Nualgi Ponds to control pond algae, improve fish health, and balance the natural food chain in their water. We love hearing from our customers so please use this upload form to send us pictures and other information about your experience.